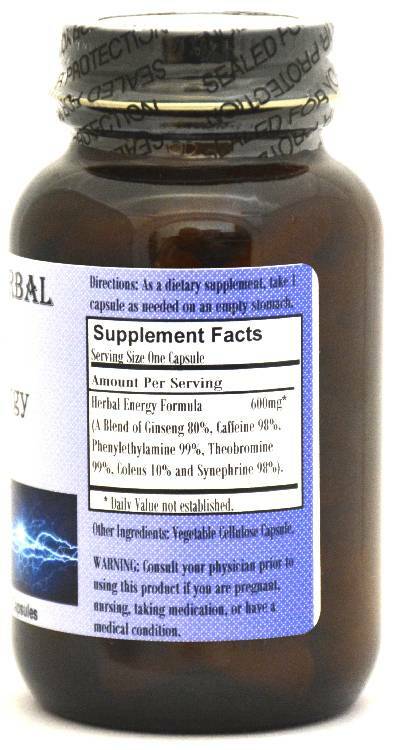 Barlowe's Herbal Elixirs is proud to offer Herbal Energy/Diet Formula (Previously called "Screaming Banshee") - a serious stimulant for those seeking to lose weight or to energize their day! This product contains the highest potency extracts available, without regard to cost. It should increase energy and boost metabolism. Bottled in Glass! No Stearates! No Fillers! No Junk! 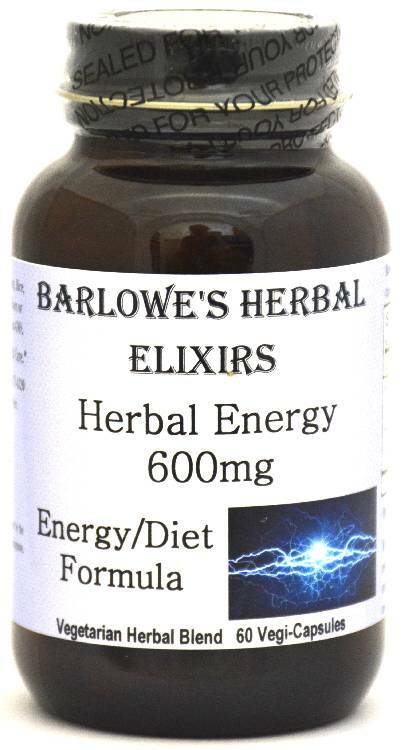 Barlowe's Herbal Elixirs is proud to offer HERBAL ENERGY Energy/Diet Formula - a serious stimulant for those seeking to lose weight or to energize their day! This product contains the highest potency extracts available, without regard to cost, including Caffeine, Phenylethylamine (PEA), Synephrine, Theobromine, and Panax Ginseng. Please use with care. Bottled in Glass! No Stearates! No Fillers! No Junk! Herbal Energy is an effective legal stimulant/diet aid. One look at the ingredient list and this fact becomes obvious. Herbal Energy contains natural caffeine derived from Coffee Arabica which, of course, has a strong stimulating effect upon the central nervous system and increases thermogenesis. It contains a good dose of Phenylethylamine (PEA) which is a major ingredient in chocolate and has a clean, smooth stimulating effect and Coleus Forskohlii which is good against "hard to lose" fat. Synephrine is extracted from the bitter orange (Citrus Aurantium) plant and acts similarly to adrenaline in the body. Synephrine increases both resting energy expenditure and body temperature. A large dose (100 mg) of this pure (and expensive) extract is contained in each capsule of Herbal Energy. Theobromine (also found in chocolate) is included in Herbal Energy as well. Current research shows that Theobromine is a potent diuretic, that it can lower blood pressure, that it improves mood, and that it increases thermogenesis. Finally, a powerful extract of Panax Ginseng has been added to the formula, as Panax Ginseng increases athletic performance, strength, endurance and overall health. Caution: Barlowe's Herbal Energy/Diet Formula is a potent stimulant and should be utilized with care. It is not intended for use by anyone under the age of 18. Do not use this product if you are pregnant, nursing or contemplating pregnancy. Do not use this product if you have any medical condition, especially heart disease, thyroid disease, diabetes, high blood pressure, psychiatric condition, difficulty in urinating, prostate enlargement, or seizure disorder, or if you are using a monoamine oxidase inhibitor (MAOI). This product contains caffeine and should not be taken by individuals wishing to eliminate caffeine from their diet. Limit use of caffeine-containing foods and beverages while taking this product because too much caffeine may cause nervousness, irritability, sleeplessness, and occasionally, rapid heartbeat. Exceeding recommended dosage will not improve results. Discontinue use and call a health care professional immediately if you experience rapid heartbeat, dizziness, severe headache, shortness of breath, or other unexpected side effects. This product is for dietary use. The above statements have not been evaluated by the Food and Drug Administration (FDA). This product is not intended to diagnose, treat, cure, or prevent any disease. Directions For Use: Take one or two capsules daily with or without food, ideally in the morning as it does have a very strong stimulating effect. When used daily, take a couple of days off per week for best results. Dosage amounts may vary based on body type and weight.